There isn’t a material much more effective for channeling and releasing extra moisture than human skin, but a team of researchers at the University of California, Davis are developing a material inspired by that gold standard. The waterproof fabric has channels that pull moisture away from where it shouldn’t be (presumably your skin) and drains it away on the outside – even when the channels are completely saturated already. This new type of moisture-wicking material could be the next big thing in workout gear. 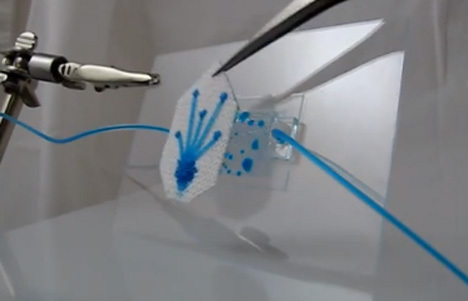 The team used hydrophilic (water-attracting) threads into fabric made from a hydrophobic (water-repelling) material. The material could be produced with existing textile manufacturing technology so clothing manufacturers could begin producing it easily. By adjusting the patterns of the hydrophilic threads, the team can control where sweat from the body is directed and where it is released from the clothing. See more in New Materials or under Science. June, 2013.